Are you looking for affordable but cute projects to make with your Cricut? Here are over 80 awesome Dollar Tree Cricut Project ideas to get the juices flowing. Several months ago, I wrote this post about Dollar Tree Products to Use with Cricut. And it went totally wild! I was so shocked to see how quickly it became one of our top five posts on Clarks Condensed. In that post, I just mention a bunch of different products that Dollar Tree sells that you could use to make projects with your machine – but I don’t share any projects. Well, I got tons of comments (most nice, some not so much) saying I needed to share ideas on how to use those products. So I turned to my trusty Cricut Support Group, and I asked them to share a photo that I could put in this post of some of their Dollar Tree projects. Let me tell you – they delivered! I was so impressed by the creativity of all these people. There are some seriously amazing ideas. So today, I am sharing the post that everyone has been asking for – Dollar Tree Cricut Project ideas! I hope that you’ll take these projects, put your own spin on them, and enjoy the world of frugal crafting. Many of these projects have designs on them that were either created by the person themselves or bought on Etsy. I do not have access to the files, so unfortunately, you will have to recreate them yourself 🙂 Etsy is a great place to find really fun SVG files! I’ve really been loving So Fontsy lately as well – they have some great free and paid files available. Some of these projects are seasonal, and therefore, the materials may not be currently in stock at your local Dollar Tree. Keep in mind that all Dollar Tree stores are different, and there may be items available at one store that you can’t find at yours. I recommend checking out The Dollar Tree website, because they have most of what is available in stores across the country. Shipping is just about $4.95! Some of the popular materials used in projects in this post include water tumblers, cutting boards, stuffed animals, plates, and wine glasses. However, there are several creative projects here that I wouldn’t have ever though to do! As much as I wish the Dollar Tree sold vinyl, adhesive foil, etc….they don’t! So most of these projects are comprised of items found at the Dollar Tree, except for those. I know a lot of people like their contact paper for transfer tape, though. Make sure you read this post about what type of vinyl to use for craft projects. Now, without further adieu…all the projects! If you are new to Cricut, make sure you check out our Cricut for Beginners course – it’s just $9.99! I think these are so cute! A few people mentioned that they used a hair straightener and teflon paper to iron on the vinyl. This one ^^ was done using glitter and mod podge – she said everything for this craft was from the Dollar Tree! You can also order items on line although you have to order a case it is still the same price but not all items are always in the store. Great for when you are doing special days. Awesome ideas. Our closest Dollar Tree is about 25 miles away. But we have a Dollar General, and a Fred’s, so we’re good to go. ? Love these. I’ve been seeing designs for different things, and making them my own with my Cricut. I want to make a stencil for my cannisters. I have some labels I made on my Cricut. I use half gallon mason jars, and quarts and even gallon ones. I love mason jars, too. Isn’t it fun to see all the different ideas?! I’d love to see anything you create! Why spend more when you can spend a DOLLAR?! 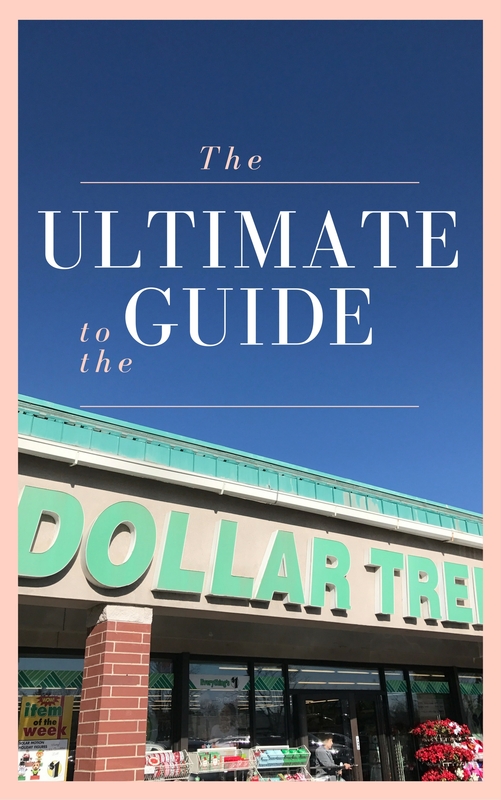 This eBook has our best tips for shopping at the Dollar Tree!